First, we want to give a shout out to our #ShakeItUp November Challengers! Welcome to week 2 :) There's not much better than LOSING weight over the holiday season ... right?! 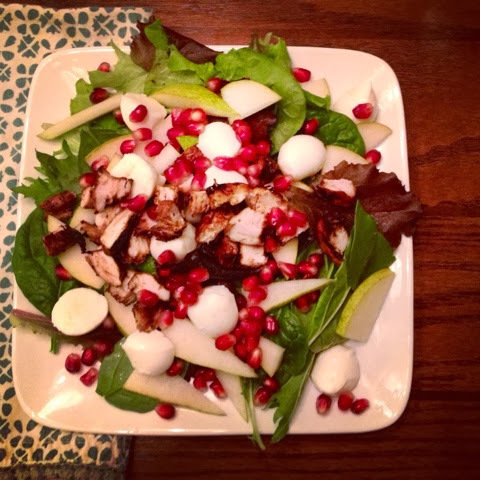 Today we are sharing our pear & pomegranate chicken salad that is fresh, festive and comes together in just 15 minutes! This is the perfect meal to serve up on any busy weeknight because it's quicker to cook than ordering take out AND you will feel so good about eating and serving this up to your family. Tonight we are taking full advantage of the fresh fall produce with minimal cooking but maximum flavor! 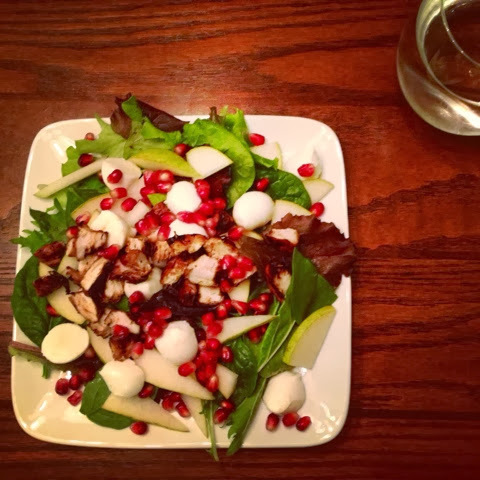 This colorful combination starts with a bed of organic baby greens, ripe pears and fresh mozzarella cheese. We top this off with grilled balsamic chicken and pomegranate seeds for crunch & color. Finish this off with our homemade balsamic dressing for a sweet finish! 1. Heat grill pan over medium high heat and add olive oil to pan. Season chicken with garlic and grill up 4-5 minutes on each side until cooked through. Add vinegar to pan & flip chicken to coat. Remove from pan, slice & set aside. 2. Cut pomegranate in half & remove seeds. 3. Slice pears & fresh mozzarella. 4. Plate up greens and layer on pears, mozzarella and chicken. Sprinkle on pomegranate seeds and drizzle on 2 tbsp of balsamic dressing. Love pomegrantes so this is right up my alley!